Welcome to the Sunset Sails Tours! We are the first Catamaran company to operate in Manuel Antonio, Costa Rica. Here at Sunset Sails Tours we focus on customer satisfaction. We strive to perform the best Catamaran Boat Cruise. 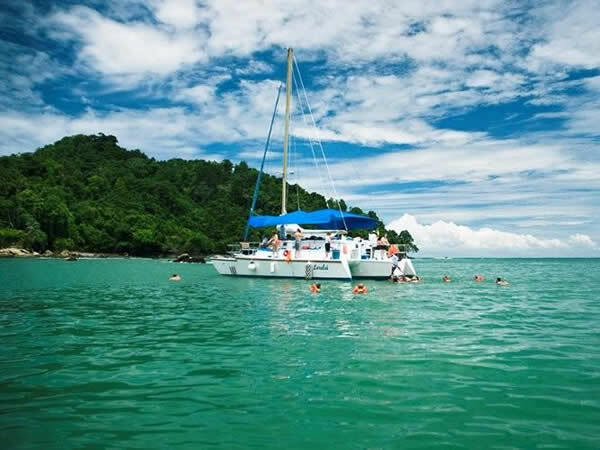 The Catamaran Tour in Manuel Antonio, Costa Rica with Sunset Sails provides you with a great adventure for Snorkeling, Dolphin and Whale watching. We have two type of tours, a morning and an afternoon. The morning catamaran tour is from 8:30 to 12:30 while the afternoon sunset catamaran tour is from 2:00 p.m. to 6:00 p.m. In both tours, we include transportation, fruits, snacks, drinks, and a lunch or dinner, as well as the snorkeling equipment for adults and children. Want to read more about our Morning & Afternoon Catamaran & Sailboat Tour? For those who are unfamiliar with a Trimaran, it is very similar to a Catamaran. In fact the only big difference between the two, is that the Trimaran has a main hull and two smaller outrigger hulls, while a Catamaran has two hulls. Enjoying a Catamaran Sunset Tour in Manuel Antonio Costa Rica is the same as being on our 49 ft Trimaran which offers plenty of shade and space for all passengers. I traveled with a group of 8 friends, we booked the catamaran for one morning to go whale watching and snorkeling. On the catamaran they provided juice, rum drinks, pineapple for a snack and fish, rice and veggies for lunch. 2 of us are gluten free and they provided a fish option for us as well. We all had a great experience and we did see multiple whales! Followed by a boat ride, and a snorkel/swim. After snorkeling and swimming we went back to the dock for lunch because multiple people were sea sick, which was fine with everyone. It did not take away from the experience. Lunch was delicious! Minor and the boat crew were fantastic! Wonderful guided sail boat tour. Don't get too excited about the snorkeling, but still a great time with fantastic hosts! Just returned from a great morning onboard with Sunset Sails. Alex was an excellent host and ensured everybody had a wonderful morning. As it is off season there were only 6 passengers, which made if feel like an exclusive tour. We saw a great variety of sealife, including Spotted Dolphins, Pelicans and flying fish. Lunch was amazingly good, fresh fish with rice and potatoes. The crew were highly professional and friendly. If you are going to Quepos/Manuel Antonio - book this tour as the boat is smaller and the crew are great. Thanks guys for a lovely morning on the water. Fui con mi familia y la pasmos muy bien, vimos ballenas y delfines, la tripulación nos atendió super bien! La comida estuvoy fantástica!Si estas en Manuel Antonio debes hacer este tour! !! La pase muy bien con mi familia, vimos el Parque Nacional Manuel Antonio, también vimos ballenas, delfines y tortugas. 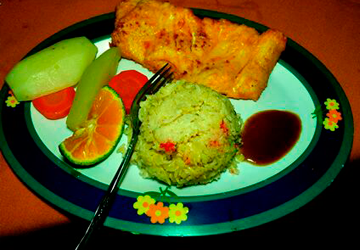 La comida (arroz, vegetales y pescado) la preparan en el barco y es muy deliciosa. También hicimos snorkeling en Bizans, esta parte le encantaron a mis hijos por el tobogán que tiene el barco.El personal nos atendió siempre con una sonrisa, muy amables y atentos hacía nosotros.Si vuelvo a ir Manuel Antonio definitivamente vuelvo a ir con Sunset Sails Tours! Mi familia y yo tuvimos un tour increíble, todo el personal estaba alegre y capacitado, mi hijos quedaron muy contentos de poder ver los delfines y las ballenas y luego quedaron aun más felices cuando utilizaron el tobogán que da hacia el mar, mi esposa es muy quisquillosa con la comida, pero esta ves quedo encantada con el delicioso pescado cocinado en el barco durante el recorrido, yo por mi parte quede feliz de ver a toda la familia pasarla bien. Sunset Sails Tours provides the best morning and afternoon sunset excursions around the coast of Manuel Antonio, Costa Rica. The service is incredible. They serve a delicious meal prepared on the boat and offer plenty of refreshing drinks. The crew speaks English and Spanish and are great at providing information about the area. 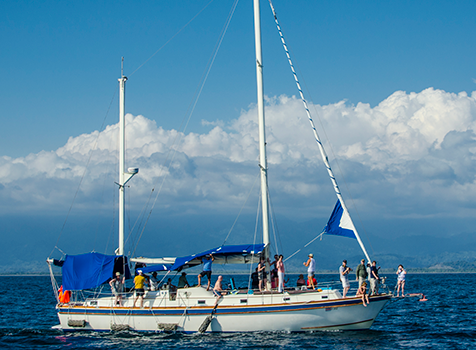 If you are looking for the best boat tour company in Manuel Antonio, choose Sunset Sails Tours. We took the 4-hour sunset cruise on a catamaran in April 2016. The boat held a lot more people than went so it didn't feel crowded at all. There was a slide and plenty of shade. The service was amazing! We were handed drinks almost immediately and they keep coming. We were served a late lunch/early dinner of traditional food which was very tasty fish. We were pampered and waited on constantly. We went snorkeling near a coral reef where the guide actually threw out food to make sure some fish would come around for us to look at! They had a fresh water shower for us when we got out of the ocean. The people were friendly and fun. We had a blast and I highly recommend using them! True to its namesake; Costa Rica, which means “Rich Coast,” Manuel Antonio’s beautiful coast is rich in both marine and terrestrial wildlife. The mountain rain forest slopes right down to the beautiful white sand beaches. 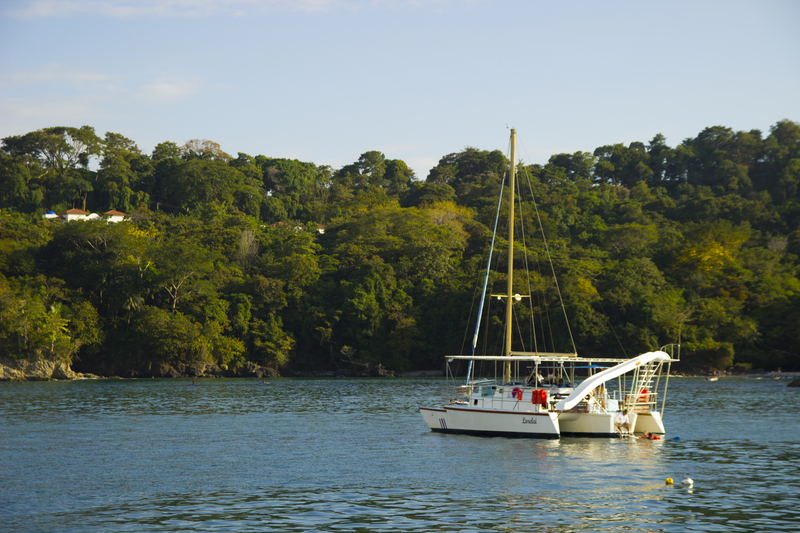 A morning or afternoon (sunset) cruise aboard either our Sailboat, or Trimaran, is the perfect way to enjoy all that the Manuel Antonio Coast has to offer. 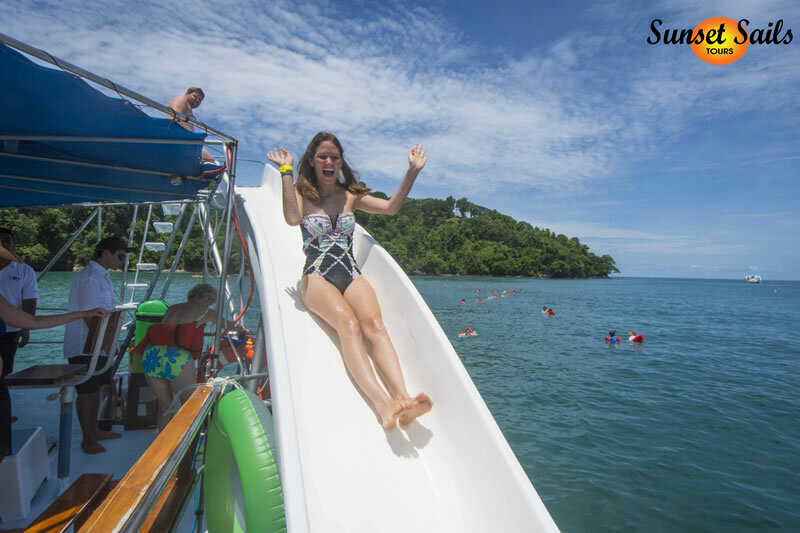 Our catamaran cruise is ranked on TripAdvisor as one of the best things to do in Manuel Antonio. As you sail past the offshore islets, which serve as a rookery to many sea birds, including brown boobies, frigates and pelicans, you’ll marvel at the graceful way they soar. You will thrill to their amazing displays of fishing prowess, as they dive into the ocean, and fly away with their catch. 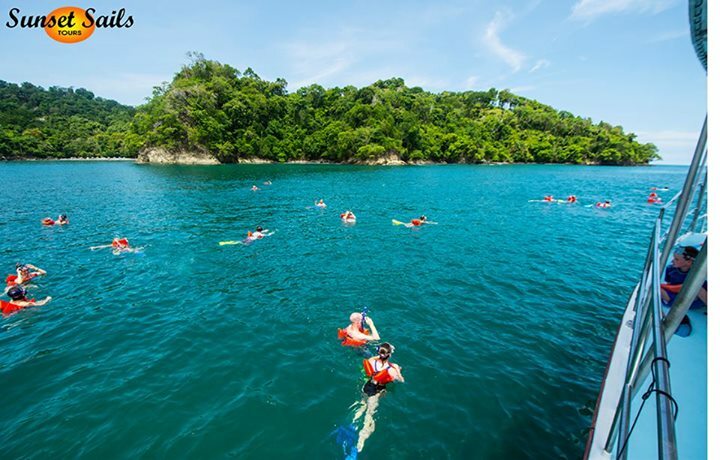 One of the highlights of your tour is snorkeling, while at anchor in a beautiful Jungle Bay. 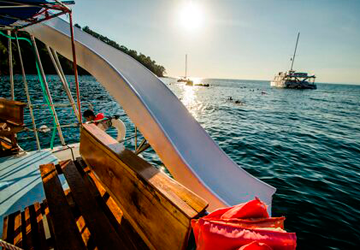 All of your snorkel gear is provided by the crew of Sunset Sails. 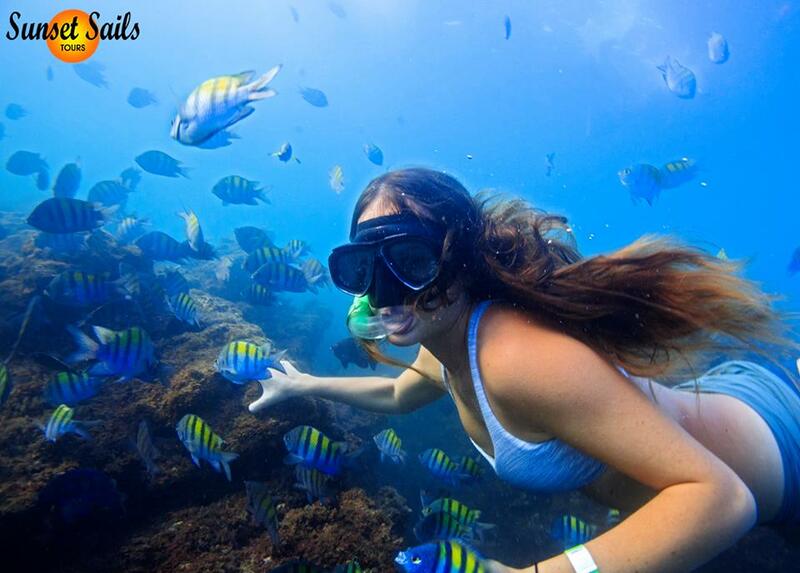 A guide will lead you to the reef, which is home to many species of beautiful and fascinating fish. If you float cracker crumbs, you’ll be amazed, as schools of fish dart all around you, in a feeding frenzy. Parrotfish, damselfish, sargeant majors, wrasses, puffers and many more beautiful fish abound on the reef. If you have an underwater camera, you might want to bring it with you. 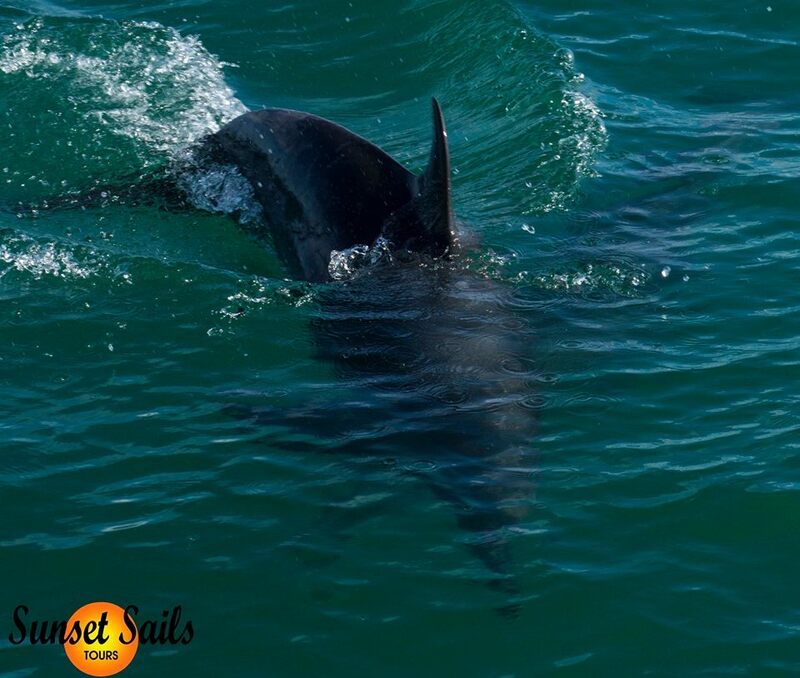 As your boat glides through the water, you will likely encounter Dolphins, which love to swim in our bow wake. Occasional Giant Sea Turtles and whales are a special treat, when they appear. It is always a thrill to see the reaction from our guests when we encounter dolphins on our Manuel Antonio Coastal Boat Cruise. The dolphins that are most frequently seen are the Spotted Dolphin, Bottlenose Dolphin and Snipper Dolphin. For those interested in viewing the Humpback Whale, the best time to see this magnificent mammal is from August through the end of October. We have written an article about our whale watching cruise in Manuel Antonio. Of course, one of the real highlights of our Sunset Cruise, is the Sunset. As the sun sets into the ocean horizon, it often creates spectacularly beautiful displays of color. It’s a perfect, romantic ending to a beautiful day in “Paradise”. Whether on our Trimaran or Sailboat, Sunset Sails Tours is your number one choice for a wonderful and relaxing boat tour in Manuel Antonio, Costa Rica. Both of our boats are located in the Marina Pez Vela, which is conveniently located in nearby, downtown Quepos. Our Van will pick you up at your Hotel or Villa (free transportation is provide in Manuel Antonio and Quepos area), and bring you right to the Marina. Our 54 ft Sailboat named Camaradien is very popular with Honeymooners and Small Groups who enjoy a more romantic and private experience. Our 49 ft Trimaran named Lorelei is perfect for larger groups.Both boats offer plenty of space and comfort and are fully equipped with all safety and navigational equipment. While savoring the delicious food and refreshing drinks, you’ll discover first hand, why Sunset Sails is known for the first class service we provide. It’s all part of insuring that you have a wonderful and memorable cruise. 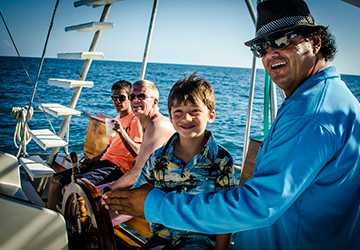 With over 20 years of experience, the Sunset Sails Crew will ensure you have an unforgettable experience in and on the water. Join us now for your perfect adventure cruise in Manuel Antonio, Costa Rica.